If you can’t face reading it all, O ye of little faith! But I suppose I can tell you that after lengthy consideration of a number of candidates in what are now Syria, Iraq, eastern Turkey and Afghanistan, the author concludes that the terms of Genesis chapter 2 best suit a valley in the mountains of the Hindu Kush. In other words, the site of the Garden of Eden is Bamiyan. An arresting theory, I think we can agree, but this account in Calmet’s Great Dictionary of the Holy Bible seems both sensible and succinct alongside its source, “On Mount Caucasus”, a massive, intricate and thoroughly unhinged article written by one Capt. Frances Wilford in the journal of The Asiatic Society, Asiatick Researches, in 1799. And yet, wildly eccentric as Wilford’s article was, it was taken seriously by more than just the editors of Calmet’s Great Dictionary. Its strange geographical claims lie behind Shelley’s “lyrical drama” Prometheus Unbound, for example, and it was Wilford’s article which first gave Bamiyan its celebrity in the West. In the two centuries before they were destroyed, the Buddhas of Bamiyan were the must-see destination for foreign travellers in Afghanistan, whether British agents, French officers or American hippies. Wilford’s specific claims about Bamiyan were abandoned and forgotten, but Bamiyan was irrevocably on the map. The practice of Buddhism has been extinct in Bamian for perhaps eleven hundred years by now, yet the peace which the practice brought with it still reigns there. You will feel it if you look out across the valley in the moonlight. There is peace in the glistening white poplar-trunks. There is peace in the shadowy shapes of the Buddhas and their caves. As you gaze, this Buddhist peace will come “dropping slow” upon your restless Western soul. 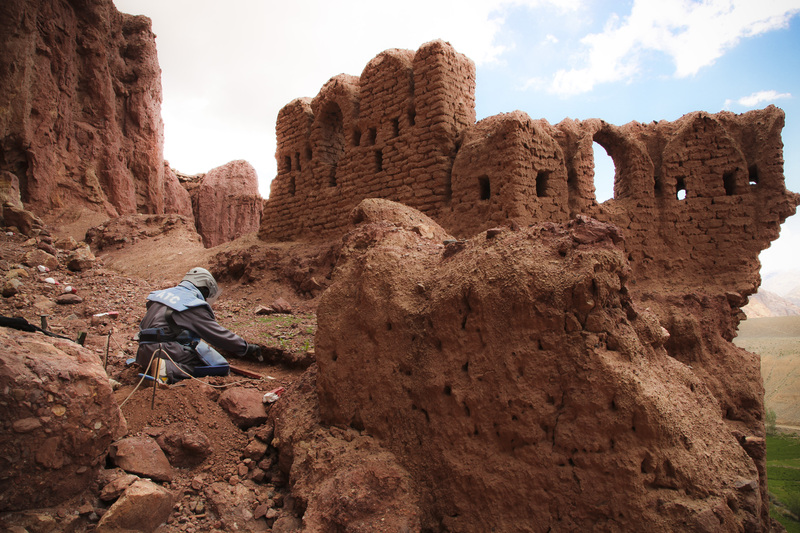 The recent history of Bamiyan has been anything but peaceful, and the valley a long way from paradise for its inhabitants. The repeated Taleban incursions into the Hindu Kush during the civil war (up until 2001) witnessed brutal mistreatment of the mainly Shia Muslim population there (the Taleban consider Shia to be heretics). This report of the UN Special Rapporteur Kamal Hossein gives some impression of the atrocities they suffered at the hands of the Taleban and their foreign allies. In the midst of this brutality against the civilian population, the Taleban also blew up the Buddhas of Bamiyan, in March 2001. A question that exercised me while I was writing about the Buddhas, and still bothers me now, is the basic one of why these giant statues were destroyed. A lot has been written about Afghanistan in the run up to 9/11 and the NATO invasion, including the destruction of the Buddhas, but the picture gets no clearer. What I’m going to share here, a fragment of evidence that has emerged recently, won’t make any decisive difference, either, but it highlights one dimension of the process. The destruction of the Buddhas of Bamiyan was an expensive and technologically challenging project. It involved a massive allocation of resources to a remote valley in the mountains for an extended period of time. It all took place in a country which was impoverished, deep in civil war and experiencing an extreme humanitarian crisis. It was a staged media event, too. Mullah Omar’s edict that “all fake idols must be destroyed” was distributed to international journalists, and Al-Jazeera had a cameraman there as the demolition was going on (he was later convicted in Spain of “co-operating with a terrorist organisation”). A group of journalists were flown to Bamiyan after the destruction to witness the scene. It became headline news across the globe. One way of tackling the question of why the Buddhas were destroyed is to ask Cui bono? Who benefited? Whose interests did it serve? One of the few things that commentators on events in 2000-2001 broadly agree on is that al-Qa’eda and the Taleban were in essence very different organisations, one with an international perspective, the other with much more domestic ambitions; but that in this period the foreign fighters based in Afghanistan came to exert as much influence over the Taleban as they ever did. How close Mullah Omar and Bin Laden came, and how great the influence exerted, is a much debated point. Some, like Roy Gutman and Finbarr Barry Flood, have seen the attack on the Buddhas, and the vandalism in the National Museum of Afghanistan in Kabul the previous month, as symptoms of a growing influence exerted by bin Laden and his collaborators over elements of the Taleban leadership. Al-Qaeda always needs a mise-en-scène – the volunteer for death filming himself before carrying out an action, the execution of hostages in front of the camera in a macabre ritual … The staging is then taken up, for free, by the media: rolling coverage of the attack on the World Trade Center, front pages for any attack in which innocent westerners are killed. The aim of this “propaganda of the deed” is of course to polarise, galvanizing supporters, outraging opponents, and promoting the “Clash of Civilizations” between Islam and the West that figures like bin Laden think is the inevitable upshot of contact between Islam and the West. Well, coincidentally or not, Bamiyan was in its effects a model jihadi publicity stunt, outraging and alienating the West, while increasing the flow of foreign jihadists to Afghanistan. Flood describes it as “a performance designed for the age of the Internet.” Bin Laden loved his symbolism, too, and to a Salafist manner of thinking, the Buddhas of Bamiyan and al-Qa’eda’s targets in New York six months later were in the same category, emblems of the ignorance of a time before, or a time outside, Islam. At min. 2.45 here, for example, Bin Laden, talking about 9/11, calls America “the Hubal of this age”. Hubal was an idol worshipped in Mecca in the Age of Ignorance before Islam, destroyed along with all other idols by the Prophet. To bin Laden’s obscenely reductive way of thinking, both events were pious acts of idol-breaking. The new piece of information is a charge sheet issued by the US Department of Defense against Abd al-Hadi al-Iraqi. Al-Iraqi, an ethnic Kurd, is now held at Guantanamo Bay, having been picked up by the US as he attempted to enter his native Iraq from Iran in 2007. Al-Iraqi was a very senior figure in al-Qa’eda indeed, often referred to as “Number 3” in the organisation after bin Laden and Ayman al-Zawahiri, the most senior commander of foreign fighters in Afghanistan before the overthrow of the Taleban in 2001. Al-Iraqi shared bin Laden’s global perspective, and was also involved in training foreign recruits for activities back in their own countries. He apparently identified the UK as especially promising territory: through al-Iraqi’s capable hands passed two of the 7/7 suicide bombers and other would-be homegrown terrorists such as Omar Khyam, convicted in 2007 of a plot to blow up Bluewater shopping centre and other targets with bombs made from chemical fertiliser. In other words, al-Iraqi is a ruthless and intelligent man fully in sympathy with bin Laden’s ideal of global conflict. In or about March 2001, in his role as al Qaeda commander of the region, Abd al-Hadi led a group of al Qaeda operatives who assisted Taliban members in the destruction of the Buddha statues at or near Bamiyan, Afghanistan. If true, it’s striking that someone so important in the al-Qa’eda network got involved in the destruction of the Buddhas. To me it would suggest that al-Qa’eda had a key role in these events, and I’m not the only one with that suspicion. But at the very least it would establish that al-Qa’eda saw the demolition of the Buddhas of Bamiyan as something that would further their aims, and I think it’s easy enough to see why they might think that. I started this blog with a search for paradise, which in certain minds settled upon the beautiful valley of Bamiyan. It seems at least possible too that Bamiyan occurred to more recent minds as a means to unleash what most of us would consider hell, global strife: to the jihadi mentality, of course, that conflict also offers some perverse promise of heaven. But if the events in Bamiyan in 2001 were indeed designed to provoke the West, it could be considered the last legacy of Thomas Wilford. If the West cared enough about an obscure valley in the Hindu Kush to be provoked, it was perhaps ultimately Wilford and his wild fantasy that the “progenitors of mankind,” Adam and Eve, originated in Bamiyan that ensured it was a target of fundamentalists in 2001.